Daughter Sarah, born 1977; son Michael, born 1983; son-in-law Andrew, born 1976; grandson Bradley, born More…2006; and granddaughter Addie born 2011. Some of you may remember that my father passed away in my senior year, which forced me to ditch my plans for college and head off to work. I combined full-time work at the Life Insurance Company of North America with night school at Villanova University. In nineteen seventy-four, I met and married (a whirl-wind romance of three months) my husband Fred. We met at the bus stop! I continued to work at INA until our daughter was born in 1977 then I volunteered in the library of our local elementary school. As soon as our son was ready for first grade I was out the door to work for nationally known water-colorist Nicholas Santoleri. For five and a half years I was his office manager, press-release writer and confidant. A desire to try my hand at picture framing resulted in switching jobs to work at the Framer's Choice, in Havertown for two years. Curiosity bit me again and I tried my hand in the antique auction business. I learned the ropes while working at Wilson's Auctioneers and Appraisers in Chester Heights. The answer to my girlhood dream, to work in a major library, was answered when I saw an add in the classifieds for a position at Falvey Library at Villanova in their Inter-library Loan Department. I worked with them until a couple months after 9-11 (2001) and the marriage of our daughter in October 2001 when I decided I wanted to take life a little easier. I had been with the Haverford Township Historical society since the early 1990's as their recording secretary so it was a natural progression for me to volunteer to chair the committee to assemble the pictorial history of Haverford Township. In 2003 the Arcadia Publishing Company published our book. On May 4, 2004, I,along with the historical society's president, accepted, on behalf of our organization, the Twenty-sixth annual Preservation Award awarded by the County Council and the Heritage Commission of Delaware County. In addition to local history, I am an avid researcher of all things historical and nostalgic and have written articles for several antiques newspapers and Hunt Magazine. Currently, I am busy with my family's genealogy and have been thrilled to locate many long-lost, distant cousins. Reading about and researching history and antiques remains my passion and keeps me out of trouble. Since 2010, I and my husband have been volunteering with the Friends of Mount Moriah Cemetery, Inc. I am the recording secretary and Fred works on the massive project of entering all the cemetery records into a database that will be accessible via the internet some day. Mount Moriah Cemetery opened in 1855 - that's a lot of records! I believe I received the finest education one could ever ask for during my years at Upper Darby. It would be the equivalent to a four year college program by today's standards. I am particularly fond and proud of my involvement with the Chorus and Concert Choir and I will always be greatful for the confidence I gained from my creative writing classes. Can't you tell? Susan Quinn Facciolli added a photo to profile gallery. Sue and Sarah atop the trees at Morris Arboretum spring of 2013. Our daughter, Sarah with her husband Andy, Sue and Fred looking for the perfect tree on the Yenser Tree Farm. Hint - our daughter is married to Andy Yenser. Susan Quinn Facciolli updated profile. View. Susan Quinn Facciolli changed profile picture. 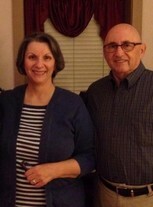 Sue and Fred Facciolli 2014.